Most bloggers understand the importance of building an email list – just look at all the opt-in forms, quite literally, popping up all over the internet. Building an email list with a great auto-responder sequence is clearly one of the best ways to sell online. However, there,s one thing that most bloggers miss in the whole list-building picture. Yes, I,m talking about the welcome email. Sadly, a lot of blogs don,t spend the time or effort needed to craft a good welcome email. Why you should care about your welcome email? First, because welcome emails get 50% open rates. Not only that, welcome emails have five times the clickthrough rates when compared to generic newsletters or transactional emails. And second, your welcome email is your first touchpoint with your subscribers after they join your list. A great welcome email can forge a successful relationship – one in which the subscribers actually look forward to the following emails. Writing the perfect welcome email isn,t too hard if you follow a few simple rules. 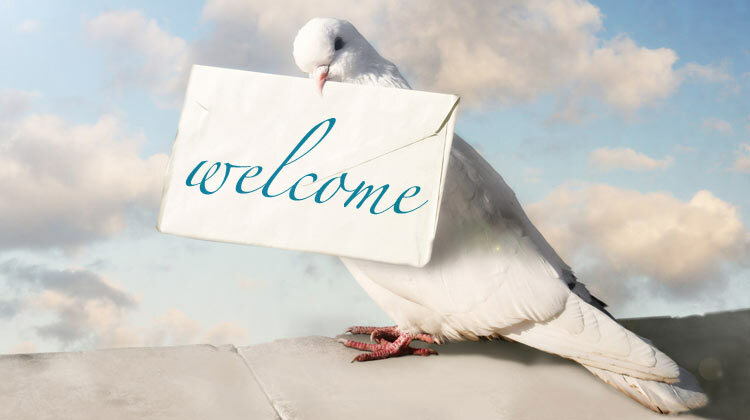 Here are 8 welcome email templates and ideas that that add warmth to your welcome message, and each is super-easy to follow. If someone buys something and doesn,t get what was promised, they’ll feel cheated. Things can get worse if it’s about a freebie. Giving instant access to what you promised doesn,t just delight your subscribers but it also makes you look credible. 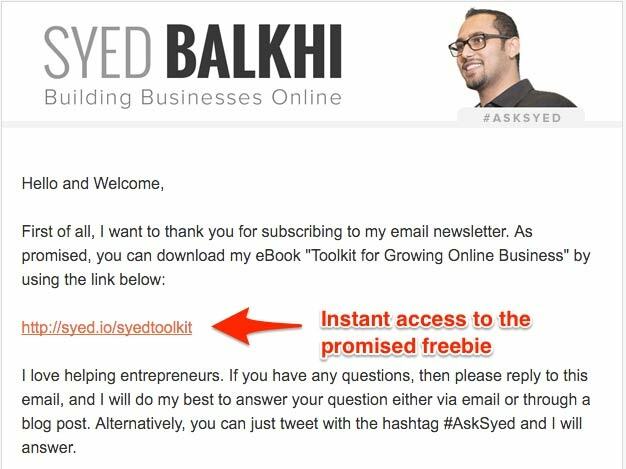 Syed offers his subscribers a direct download link to the promised file straightaway in the welcome email. Don,t be fooled by the simplicity of this rule. When not done right, it,s enough to send your email straight to trash. Or worse, marked as spam. When you create a double opt-in email sequence, your job is not done with just collecting the email. In a double opt-in email setup, you need to get your subscriber to confirm their subscription. Most marketers fail to leverage the confirmation email. Instead of branding and customizing their confirmation emails, they send bland, robotic emails with a large subscription button. Such emails feel mechanical and don,t inspire your subscribers to confirm. 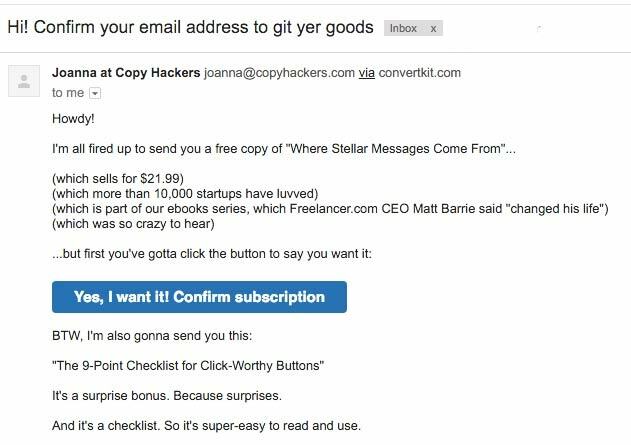 If I had to give you an example of a confirmation email that rocks, it would undoubtedly be from Joanna from CopyHackers. Like I said, a well-written welcome email can set the foundation of a strong relationship. So it pays to tell your subscribers what they should expect from your emails. Notice how James tells that her subscribers to expect a writing tip each week. He also tells how her readers can use them to improve their writing. To use this tip in your welcome email, tell your subscribers what your emails will be about and their frequency. After making your welcome email relevant with your opt-in offer, the second most important thing you need to do is to write relevant subject line. Again, the best way to write a relevant subject lines is to make it consistent with the opt-in offer. The most common mistake that blogs make with the subject line is when they use the double-optin form. They just don,t customize the subject line of the confirmation email and send boring subject lines like “Confirm Subscription” and more. The problem with generic subject lines is that they don,t inspire users to open the email as most probably they don,t remember who the sender is. But once subscribers see familiar words from the opt-in offer and the sender,s name, then BINGO – they suddenly know that they subscribed for that particular newsletter. A blogger who does this right is Jimmy Daly from GetVero. He cleverly optimizes the confirmation email,s subject line to match his newsletter opt-in offer. Look at how the subject line of the confirmation email instantly reminds the subscriber of the newsletter swipe file. Mentioning the name of the freebie (if any) can be particularly helpful here. The Experian Welcome Email Report states that welcome emails that link to social media get 6% higher click through rates. Now you,ll agree with me on this: once someone subscribes to your list, it,s safe to assume that they see promise in your work and that they,re interested in what you,ve got to offer. If so, why not invite them to connect with you on social media as well? It just makes sense. 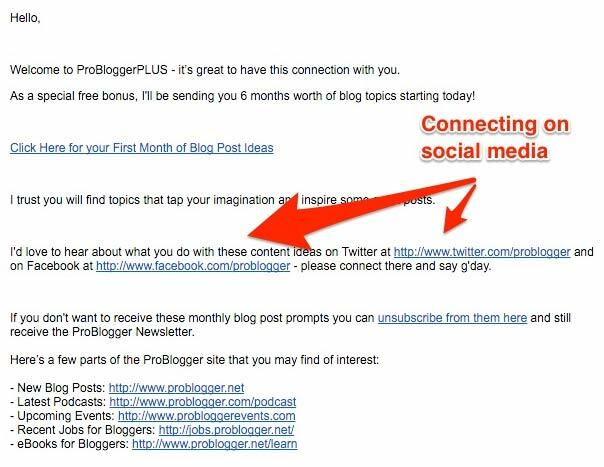 In his welcome email, Darren from ProBlogger invites his subscribers to connect with him on Twitter and Facebook. Here,s the thing: If a subscriber really wants to follow you, they will happily engage with you on social media. So if you get 100 signups a week and even if just 20% of them listen to you, you,ll have an additional 80 followers on your social media each month. Some of you might think “Oh, this is kinda obvious advice.” True. But still a lot of blogs don,t care. Saying a simple “Thank you“ can make your readers feel like you appreciate their commitment. Plus, you get to follow up your gratitude with more requests like following you on social media, sharing your content, and so on. Also, this is also the perfect thing to say if you can,t think of anything else to write in your welcome email. A small thank you welcome email is better than no welcome email. One of the biggest challenges that most blogs face is to get the readers to talk. Here,s where a welcome email comes in handy. Because welcome emails get high open rates, they,re a great way to engage subscribers and encourage conversation. Undoubtedly, asking open ended questions is one of the smartest ways to start a conversation. 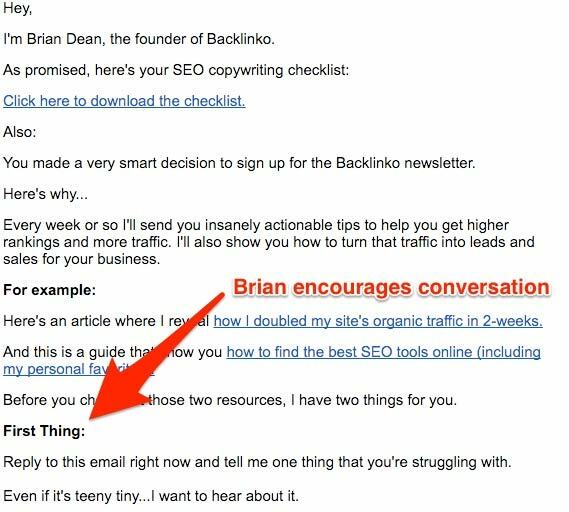 The perfect example of a welcome email that encourages a reply is that of online marketing expert, Brian Dean. When you write a question in your welcome email, write a simple one. Or just copy what Brian says. (As I do). Another very useful purpose of a welcome email is to lead your new subscriber to the most popular and useful posts on your blog. By doing so, your subscribers will see the real value you offer. And when they do so, they,ll be encouraged to follow you more and read more of what you have to say. For example, for a blog like mine that teaches people how to make passive income and publishes income reports, it would make sense to add links to a few recent income reports along with a few other important links. To choose the best pages to include in your email, just look at the most high-traffic pages on your site. In addition to all the above tips, you could also give your readers the instructions to whitelist your email so that they never land in SPAM. You can do it! Write a welcome email! As we saw in the above examples, there are blogs that send great welcome emails. And there are those don’t. But there,s a third type too “” the ones that don,t send a welcome email at all! This is crazy because a whopping 74.4% subscribers EXPECT a welcome email! Such blogs contact their subscribers after days or weeks of signing up. The biggest problem with this approach is that the subscribers will like forget them by the time they finally reach out. And we all know happens to emails that land up unexpected “” they head straight to SPAM. Which is the best welcome email you,ve ever got? Or how do you welcome your new subscribers? Please leave a message in the comments down below. Don’t know how to set up welcome emails? Take my free course in Email Marketing. Thanks for this Rob. I’m going to be working on a new autoresponder series soon and this is some excellent advice that I need to keep in mind. I agree that we rely too heavily on the default, robotic confirmation email. We can make it much more personable and entice more people to confirm. We also have to make sure that we don’t distract the reader from taking that action as well. The whole signup process, the confirmation and thank you email, etc., is something you need to go through again and again and again. There are so many points where “friction” can occur and where you can lose people. It’s important to sign up to your own list – or get friends to – to see what the process is like from the user’s perspective. I hope this article can help with that. How do we setup these emails to automatically send out to new students from our school? At the moment, it seems that new students are sent an email from teachable itself and not from our school – how do we change that? Surely we want to be able to send to new students info about our school and courses etc, not how to start their own school? Hello Emina, I don’t use Teachable so I don’t know. I would suggest you ask Teachable this question. Loved it Rob! Must implement this right away. Would also like to learn from you the perfect auto responder sequence. H’mm, Jyotsna, I’d like to know the perfect auto-responder sequence. But, yes, I hear you. I could do another blog post on that.